Close encounters with wild, free and beautiful animals and birds in their natural habitat create the experience of a lifetime. 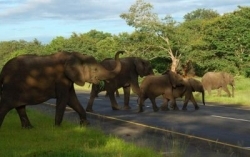 There are a variety of different game-viewing venues and styles: on foot, in open-air vehicles and even on elephant back, but no matter which option you choose, you'll have vivid memories that will stay with you the rest of your life. Your wake-up call comes hours before the sun rises, so you can experience tracking nocturnal hunters such as leopard and lions when they're on the prowl, before the heat of the day kicks-in. 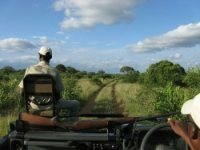 After a quick cup of tea or coffee, you embark on a three- or four-hour game walk or drive with a super-knowledgeable ranger and tracker. During this time, you'll be able to take your greatest dream of spotting an animal in the wild and multiply it by a hundred. You see not just one elephant, but a dozen, from a playful baby to a two-story bull knocking over bushes with a shake of its head. Spot a regal gemsbok, with its slender, scimitar-like horns, and understand how they may have inspired tales of the fabled unicorn. The roar of a male lion, a few yards from the safari vehicle leaves you nearly breathless. 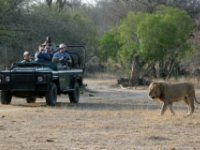 Return to camp for freshly cooked breakfast followed by a nature walk with a ranger or a visit to a local village. After lunch, take a nap at the height of the midday heat or go for a swim. 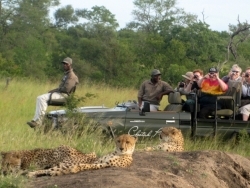 Then, following afternoon tea, you're off on an evening safari drive that includes a stop for a sundowner, a cocktail enjoyed as the sun sets. Back at your lodge, enjoy dinner under the southern constellations - a completly different array of stars from what you see at home. 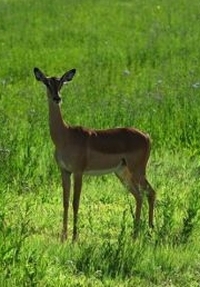 Then it's off to bed and dreams of the wildlife that you'll encounter tomorrow. Entering the English language in the late 19th century, the word safari means "long journey" in Swahili, originally from the Arabic "safra" meaning a journey. 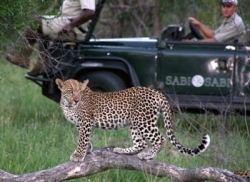 A safari is an overland journey. 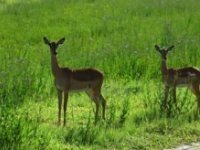 It usually refers to a trip to Africa, traditionally for a big-game hunt; today the term often refers to a trip taken to observe and photograph big game and other wildlife. There is a certain theme or style associated with the word, which includes khaki clothing, belted bush jackets and pith helmets. The term "safari" also covers other adventurous journeys and expeditions, including whale watching safaris, Arctic safaris, eco-safari, etc. 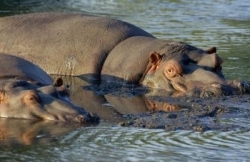 The best known safari areas in Africa are the Masai Mara and Serengeti in East Africa, Kruger National Park in South Africa, Etosha in Namibia, and the Okavango Delta and Chobe National Park in Botswana. 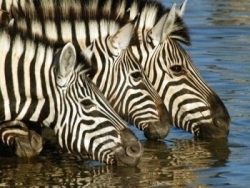 The best known safari area in South Africa is Kruger National Park. Located in the northeast corner of the country, along the border with Mozambique, it covers 7,500 square miles and contains 16 distinct natural areas. 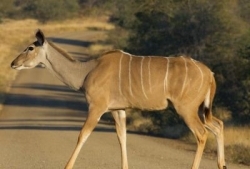 Kruger National Park is a great location for "Big Five" viewing: lion, leopard, elephant, buffalo and rhinoceros., but also giraffes, zebras, antelopes, wildebeests and an amazing variety of birds. The most social of the cat family, lions live in prides consisting of one or two males, up to seven females and a dozen or more cubs. Standing 48 inches high at the shoulder, males average just over 400 pounds, females under 300 pounds. The strongest climbers of the big cats can kill prey much larger than themselves. Males can grow to over six feet long and over 150 punds; females are about two-thirds the size of males. 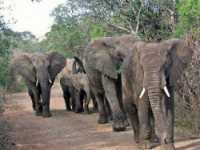 The African elephant is the world's largest land mammal, often towering 11 feet or more and weighing up to six tons plus. Its trunk is used to eat, smell, carry, dig, trumpet and spray itself with water. These large, ox-like beasts stand over five feet at the shoulder and grow up to 1,700 pounds. 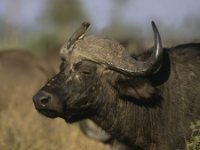 Herds can have as many as 1,000 or more buffalo. 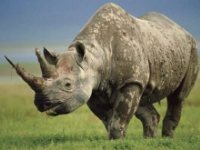 Rhinos stand about five feet at the shoulder; adult black or hook-lipped rhinos weigh up to 1.5 tons, and white rhinos weigh over two tons. The white rhino derives its name from the Dutch "weit" meaning wide, referring to its wide, square muzzle.